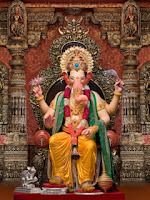 Lalbaugcha Raja or Lalbagh Ka Raja, is one of the most popular sarvajanik (public) ganesh pandals established in 1934 and located at Lalbaug market in Mumbai. Millions of people from far-off places, including foreigners visit this pandal to seek blessings of Lalbaugcha Raja. It is believed he is Mannat ka Raja, who fulfill all desires of devotees. The devotees wait for as much as 25-30 hours in the queue of lakhs of people, just for a mere glance or ‘mukh darshan’. This queue is 2.5 km to 3 km long while during peak time it stretches to more then 10 km. It is said that 2.5 crore people turn up for the darshan. 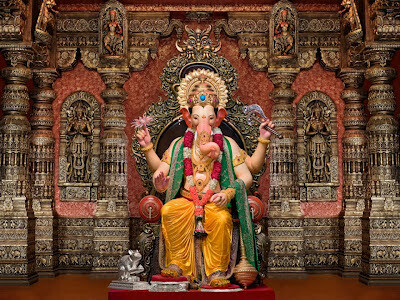 Like last year, this year also Lalbaug Sarvajanik Ganeshostav mandal of Mumbai will organise the Lalbaugcha Raja’s first look and photoshoot one or two days before the Ganesh Utsav(Ganesh Chaturthi) which is scheduled to start from 9th Sepember 2013.